This school year is big around here………my Monkey #1, the timid and shy Mr. By The Rule Book is off to Middle School! I still remember his first day of pre-school; though he was apprehensive and scared of how his day was going to be he didn’t show it. He went straight up to the class, looked at me for some reassurance, and off he went. He’s always been like that, even if he is scared deep down he doesn’t show it, tries to put up a very brave front almost to the point that for folks who don’t know him well will have no clue of how scared and unsure he is on the inside. But to us, B & I we know him only too well. All he is saying to us about starting Middle School is that he’s gonna miss Elementary. He is not overly excited not too sad, just being cautious…..and scared inside. So when he got a chance to attend an introductory camp at his new school a few weeks ago I jumped on it. Again he was unsure if he wanted to go but knowing him I had a feeling that once he is familiar with the surroundings he’ll feel at home when the school starts. To his surprise, he loved the camp and is now looking forward to Back to school night. The best thing about going to the camp he got his lockers already! It was fun seeing how the kids at the camp, both boys and girls were going all out decorating their lockers with all kinds of accessories! My monkey is not into all that (his words), as long as he can stay organized and not too messy he is good. Look at the half grin! Bet ya he has his doubts about the whole thing! 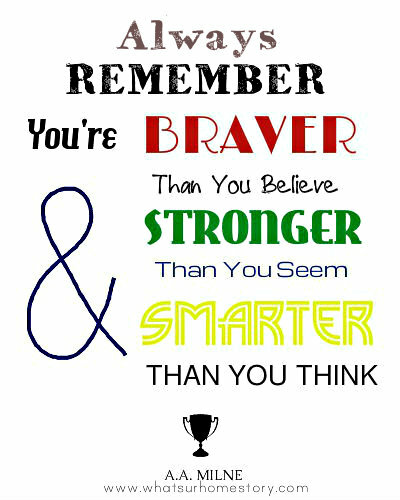 As my baby is starting off this major milestone in his life I thought I’d make him a little something for his locker, a quote that he can look up to for inspiration when he feels unsure……..This gem from the Winnie the Pooh creator, A.A.Milne fit the bill perfectly (you can download here). We were at Staples the other day to get all his Back to School supplies and I saw this whole aisle full of Sharpies. I’ve used the black fine markers before to make art but this time around it was the colored ones that caught my eye. As you can see the locker is kinda small and dull, a dash of color wouldn’t hurt. And thus formed the DIY Sharpie Canvas Art idea. Add some of the Acrylic paint (yellow ochre) to the Gesso and prime the canvas. If you like a white background you could totally skip this step or just paint whatever background color you like. While the canvas dries, print out your quote (I created mine in Pixlr) in the darkest possible setting. Darker letters are going to be easier to trace. Turn the quote paper over, place over the hard surface, and trace the letters on the back side of the paper. I went over twice to get them really dark. Turn the paper over again so this time the good side is facing you and away from the canvas. Place it traced side down on the canvas while making sure that it is centered. You can see the “Always” is missing in these pics. The lettering was really light on that at first and it didn’t print at all! I had to recreate it in dark and go back and fill it in. With a sharp pencil trace over the letters like you would normally do. What this does is it transfers the lead pencil markings of your earlier tracing on the back to the canvas. Now comes the fun part, Sharpie time! Gently trace over your pencil letters and fill in using only very light pressure. If you press down hard the ink tends to dry out soon for a very long period of time. Gentle pressure ensures a good flow of ink throughout. Isn’t that perfect for his locker? We plant to hang it with Command Strips. How is your back to school prep going? Do you craft with Sharpies? If not then you must! Go grab your pack of Sharpies and make some easy art! All Sharpie Fine and Ultra Fine markers and highlighters are currently on sale at Staples “while supplies last”. Love that! We love Sharpies too! !A great quote of inspiration! Excited for the middle schooler! this is so cute, i love it!! That’s awesome! What a great reminder…for all ages! And I love me some Sharpies! What a great project! I hope your son has a great middle school experience. My students start Monday and I’m going to do my best to make 6th grade great for my kids! I would have loved this for my locker…I’d love this for my craft room too! That is one of my favorite quotes! Gotta love Sharpies! I found your blog recently it’s wonderful. Getting so many ideas to decorate my homeLoved it will make it for my son’s room. can I use tracing paper to get the quote on canvas? Thank you Namrata. Yes you could definitely use tracing paper. That would have been the easiest way. Didn’t want to run to the store to get it.